The Department is committed to the safe and responsible hunting of game animals in NSW. Illegal hunting is discouraged and responses to illegal hunting will be proportionate. The primary purpose of enforcement measures is to encourage voluntary compliance with game hunting laws and to stop or prevent illegal activities. Enforcement - Making sure a rule, standard, court order or policy is properly followed. The GLU is the lead agency for the administration of legislation that regulates all hunting on declared public land and the hunting of deer and native game bird species on private land. The GLU continues to build partnerships with industry and the community to encourage greater understanding of hunting regulations to maximise voluntary compliance. To build a culture of voluntary compliance, hunters, the hunting industry and community must take responsibility for ensuring their activities are as safe an ethical as possible and do not cause unlawful harm. Where elements of these groups fail to embrace this concept the agency will need to take enforcement action. Enforcement action provides a strong deterrent to non-compliance. The effective regulation of hunting, as well as good regulatory practice, requires the GLU to have clear strategies governing the undertaking of enforcement action. This Enforcement Policy complements the GLU Game Hunting Regulatory Policy, GLU Regulatory Strategy and annual GLU Operational Plan. Achieve outcomes consistent with legislation. Assertively apply consistent and proportionate enforcement action. This policy applies to the enforcement activities undertaken by Departmental authorised inspectors under the Act and Regulation. Summarise the agency’s general approach to enforcement. Explain how GLU undertakes activities that reduce game hunting compliance risks and enhance compliance with established standards. Explain how GLU conduct their activities to protect the economy, environment and community from negative impacts associated with illegal hunting. Assist with decision-making to ensure that enforcement actions are consistent, fair, and based on best practice. Promote compliance with New South Wales legislative provisions consistent with the objects of the Act and Regulation. Promote transparency to stakeholders on how the agency will make decisions on enforcement action. Guide decision making and action by staff in the use of enforcement options. Encourage the use of regulatory implements in such a way as to best achieve our organisational objectives. Have a risk-based approach to compliance and enforcement activities through adoption of a graduated and proportionate response to non-compliance. Using overt and covert surveillance tools. Investigation of suspected breaches of game hunting laws. Identifying measures to compel compliance without resorting to formal court action, such as warning letters, directions, penalty notices, licence suspension or cancellation, seizure of items or a combination of these. Prosecution with a view to conviction in a court of competent jurisdiction where court-imposed penalties may include fines, forfeiture of seized items and court imposed licence suspensions or cancellations. Consistent in terms of the enforcement response between regulators in the public interest. Allows for application of multiple enforcement tools under appropriate circumstances. Prosecution principles are specifically defined in the GLU Prosecution Procedures. The GLU will apply a graduated and proportionate approach to the application of enforcement tools upon all stakeholders. This approach envisages the application of mild enforcement tools to offenders in the first instance; to be followed by more severe tools should the non-compliant activity continue. Examples of mild enforcement tools that may be employed include provision of educational information or warning letters. Examples of more severe tools include penalty notices, licence suspension or cancellation and prosecution. The tool box in Appendix A provides further detail. Notwithstanding the above advice, the GLU will select an enforcement response that is proportionate to the identified non-compliance and capable of providing sufficient incentive to the business or person to amend the noncompliant behaviour. Furthermore, should the circumstances surrounding an offence be considered sufficiently serious (e.g. an imminent risk to safety), the Unit may elect to employ multiple enforcement tools at the same time. This policy should not be interpreted as a means of preventing the GLU exercising any such enforcement powers. Circumstances of the alleged offence and the individual circumstances of the offender. Compliance history of the offender, in general and with respect to the specific incident. Cooperation demonstrated by the alleged offender. Remedial action implemented by the alleged offender to address the noncompliance. Timeframe over which the offence was committed. The need to provide GLU staff with a safe working environment within the requirements of workplace health and safety laws, particularly in relation to matters involving assaults and intimidation. The following diagram illustrates the graduated nature of enforcement responses in unity with the seriousness of the non-compliance. Authorised officers are required to act within their legal remit of statutory power when undertaking enforcement activity. People or businesses should not be required, either directly or by inference, to observe requirements that are not authorised by law. Evidence obtained by authorised officers relating to actual or alleged offences should be obtained within the requirements of legislation, and also within the requirements of criminal law. Decisions should be based on evidence. Enforcement action is to be supported by appropriate evidence. Generally, evidence should be admissible and sufficient to establish that an offence has been committed (this will assist in ensuring that enforcement action is only taken under appropriate circumstances). Evidence should also be sufficient to support a case against appeal. Evidence does not need to be assembled into a full prosecution brief for minor enforcement action; however evidence should be sufficient to substantiate the offence. The GLU will undertake enforcement activity against a businesses or person in a timely manner that is procedurally fair and impartial. This will assist in minimising opportunities for arbitrary or inexplicable differences between the handling of individual cases, or classes of cases, to occur. Discrimination (e.g. with regard to ethnicity, religion, age or gender) by authorised officers when undertaking enforcement action is unacceptable. Decision making about applying enforcement provisions should not be influenced by political advantage or disadvantage to a government or any political party or group, the consequences of a decision on the personal or professional circumstances of staff, or the personal feelings of the decision makers towards the offenders. Business proprietors and/or persons involved will receive written advice of available statutory rights of appeal when decisions are made by the GLU to apply enforcement provisions. Reasons for a decision (e.g. to suspend or cancel a licence) will be documented and included in a statement of reasons as part of any administrative review of the decision. Many juveniles (10 to 18-year-olds) may be subject to enforcement action under some circumstances. Under these circumstances, legislation for dealing with children between the ages of 10 and 18 (young offenders’ legislation) applies to compliance and enforcement activity. Ensure that legislation, enforcement policies, complaints procedures and relevant information are readily accessible to regulated entities and the public. Use plain language to communicate with regulated entities, the public and the industry. Ensure that policies and procedures addressing issues associated with enforcement action are readily available. Advise of available complaint or appeal processes associated with enforcement action inclusive of timeframes applicable to these processes. In relation to issuing penalty notices, Department of Primary Industries has adopted the Attorney-General’s Caution Guidelines and Internal Review Guidelines (31 March 2010). The constraints of any privacy legislation and confidentiality provisions when initiating enforcement action against regulated entities (unless a statutory requirement exists to disclose the information) will be observed. The GLU will work with other state and territory jurisdictions to promote consistency in the application of enforcement provisions by regulators to ensure that stakeholders in different Australian jurisdictions do not receive differential treatment with respect to measuring compliance with legislative obligations. The overriding consideration in taking enforcement action should always be the protection of the community. Formal inspections to assess compliance using overt and covert means. Investigation of suspected breaches of the law. Measures to compel compliance without resorting to formal court action, including cautions, directions (e.g. to leave or not enter a declared public land hunting area), penalty notices or a combination of these measures. Seizure of game hunting equipment or vehicles. Suspension or loss of licence to engage in game hunting. Prosecution with a view to conviction in a court of competent jurisdiction where court imposed penalties may include fines and forfeiture of seized items. maintenance and management of compliance and enforcement activity. Compliance risk: the level of risk that non-compliance with game hunting laws may have on the Department’s ability to deliver the objects of the Act and other compliance priorities. Guidance for regulators to implement outcomes and risk based regulation - NSW Department of Premier & Cabinet, July 2014. Game Licensing Unit Compliance and Enforcement Policy December 2015. Seizure of equipment and vehicles. Prosecution in the Local Court. Details on some of the more commonly used enforcement tools are provided in this Appendix. The success of strategies adopted by the GLU to address non-compliance may be influenced by identification of the behavioural causes of non-compliance and the implementation of suitable measures to promote compliant behaviour. Authorised officers are recommended to routinely provide advice to the public. Advice should be presented in a way that may readily determine the difference between general advice and directed compliance advice (i.e. a legal requirement). Such advice should not extend beyond the level of expertise of the authorised officer. Verbal warnings, as they are not accompanied by formal notification, are prone to improper documentation by the regulator and the business, or misinterpretation or being completely forgotten. Due to the informal nature of verbal warnings, it is suggested that they are only used for issues of a minor technical nature. Under Section 50A of the Act an inspector may give a direction to leave or not to enter declared public hunting land. The direction can only be given where the inspector who has reason to believe that a person is committing or about to commit a game hunting offence. Details including the person's name and address should be recorded by the inspector upon giving such a direction. Details of the direction should also be recorded in the GLU Compliance Database. Relevant legislation and clauses breached. Timeframe for implementation of the proposed remedial action. Maximum penalty for the offence and the intention of the agency to enforce the legislation should the individual or business fail to address any remedial action. Warning letters are to be followed up within a recommended timeframe to ensure the required actions have been undertaken. It is likely that failure to comply with a warning letter may result in the implementation of more serious enforcement action, e.g. a penalty notice. Authorised officers have legislative powers to seizure any item they believe to be used in a game hunting offence. This generally includes hunting equipment and vehicles. Seized goods that are forfeited to the Crown should be destroyed or disposed of in a manner that ensures there can be no allegation of improper conduct. Records should be kept of how, when and where seized goods are disposed. It is further advisable to have disposals of seized goods witnessed. While seizures are undertaken to collect evidence or prevent further offences being committed they effectively impose a penalty upon the person from whom the equipment or vehicle has been seized. The person from whom items have been seized must be provided, at the time of seizure, with a statement that describes the items seized, the reasons for seizing those items and the address where those items will be held, as well as be informed of their right of appeal. A penalty notice is issued to a person who has committed a specific offence against the Act or Regulation. If the person does not wish to have the matter dealt with before a court, they will need to pay a specified amount for the offence within a specific timeframe. Alternatively, the person may elect to have the matter heard before a court. Penalty notices provide an efficient method of dealing with breaches of legislation that may otherwise require presentation to a court. As penalty notices may be referred to a court for hearing, authorised officers are advised to collect sufficient evidence to prove the elements of the alleged offence before issuing penalty notices. It is suggested that this evidence be appropriately logged and secured as for a prosecution. When considering the issuing of a penalty notice the GLU will consider the Attorney-General’s Caution Guidelines issued under section 19A (3) of the Fines Act 1996, effective since 31 March 2010. The guidelines are used by the GLU to help officers with exercising their discretion. They do not create any right or obligation to give a caution. On reasonable grounds that a person has committed an offence under a statutory provision for which a penalty notice may be issued. It is appropriate to give a caution in the circumstances. The offending behaviour did not involve risks to public safety, damage to property or financial loss, or have a significant impact on other members of the public. The person has a mental illness or intellectual disability. The person is a child (under 18). The person has a special infirmity or is in very poor physical health. The offending behaviour is at the lower end of the seriousness scale for that offence. The person did not knowingly or deliberately commit the offence. The person is cooperative and/or complies with a request to stop the offending conduct. It is otherwise reasonable, in all the circumstances of the case, to give the person a caution. Read the full version of the Caution Guidelines. The GLU Enforcement Policy advocates the use of a graduated approach to enforcement and allows for not only cautions to be given but the use of less severe enforcement tools if warranted. The Fines Act 1996 provides that all agencies that issue penalty notices have the power to internally review the decision to issue a penalty notice, and sets out the basic requirements for such reviews. The Internal Review Guidelines are issued by the Attorney General and were made effective from 31 March 2010. These guidelines will be used by the GLU as a standard to assist in conducting internal reviews of penalty notices fairly, impartially, and consistently across government and in accordance with the law. Read the full version of the Internal Review Guidelines. Applying for internal review of the decision to issue the penalty notice. Electing to have the alleged offence heard in court. The penalty notice was issued contrary to law. The issue of the penalty notice involved a mistake of identity. The penalty notice should not have been issued, having regard to exceptional circumstances relating to the offence. A caution should have been given instead of a penalty notice, having regard to the relevant caution guidelines. Note that the fact that a person has an intellectual disability, mental illness, cognitive impairment or is homeless is not in itself sufficient grounds to require withdrawal of a penalty notice. A reviewing agency is to notify the applicant in writing of the outcome of the review within 42 days of receipt of the application (or 56 days if additional information has been requested). The Director Game Licensing will be responsible for reviewing the issuing of a Penalty Infringement Notice. The Director Game Licensing may request advice from the Prosecutions Review Committee when undertaking this task (see GLU Prosecutions Procedures). Individuals that fail to comply with licence conditions imposed by legislation will be subject to enforcement action. This may involve the suspension or cancellation of a licence by the GLU or imposed by a court. Licence cancellation is a very serious level of enforcement action as the removal of a licence, if imposed can significantly limit the hunting activities of the individual concerned. Anyone who has had a licence suspended or cancelled and continues to hunt in circumstances where they require a licence may be subject to prosecution. The section should be considered in conjunction with the GLU Prosecutions Procedures. Prosecution will generally be utilised for more serious legislative breaches or for matters where less severe enforcement action has not been sufficient to convince the stakeholder to address the observed non-compliance. It should be noted that matters heard in the Local Court are subject to jurisdictional limit in relation to the maximum penalties. Submissions to the court on penalties will generally include details about the risk to the public, including the severity of the possible harm that may result (where appropriate). As a prosecution always proceeds before a court, it is recommended that all supportive evidence concerning enforcement action be made available. Evidence supporting enforcement action should be objective and as comprehensive as possible. The physical evidence (including seized material). Photographs or video recordings of evidence. Video or sound recordings of conversations and interviews with alleged offenders. Records of interviews signed by all parties. Full documentation of the chain of evidence and secure storage of all exhibits submitted as evidence should further form part of the brief of evidence. To enable an unprejudiced offence, an accused person or company on request will generally have access to the brief of evidence once investigations have been completed and proceedings have commenced. In all cases, an opportunity should be provided for alleged offenders to place their version of events on record and to outline any mitigating circumstances to be considered by those making decisions before proceedings commence. Prior to commencing a prosecution, authorised officers are advised to collect sufficient evidence to prove each element of the alleged offence beyond reasonable doubt. The prosecution case should be structured in an organised fashion that allows for expedient processing by the courts. The charge/s laid should appropriately reflect the nature and extents of the legislative breach disclosed by the gathered evidence and provide sufficient material for the courts to consider when imposing an appropriate penalty on the offending entities. Care should be taken to ensure that the laying of multiple charges does not infringe the prohibition against duplicity. On commencing proceedings, the defence may wish to pursue charge negotiations. Generally speaking, this process involves negotiations between the defence and the prosecution that may result in the prosecution withdrawing one or more charges in return for the defendant pleading guilty to some or all of the remaining charges. Charge negotiation arrangements may sometimes include agreements on submissions to be placed before the court. Charge negotiations are generally initiated by the offender. Where charge negotiation occurs the prosecution should ensure that the remaining charges adequately reflect the elements of the offence to assist the court in making an appropriate judgement. The prosecution should not accept charge negotiation proposals should the defendant wish to maintain their innocence with respect to a charge or charges to which they have previously offered to plead guilty as part of the charge negotiation arrangement. Any agreements that the prosecution will not oppose defence submissions on penalty, or the scale of the offence should only be made where the penalty nominated is considered to allow a proper exercise of the sentencing discretion. The Game and Feral Animal Control Act 2002 (the Act) and Regulation 2012 (the Regulation) provide set monetary penalties for offences. Schedule 3 of the Regulation provides a table of penalty notice offences. This table is shown below. The monetary amounts of the penalties reflect the seriousness of the offences. The penalty amounts vary from $220 up to $550. To provide perspective related to the seriousness of these penalties, the penalties have been classed as Tier-1 and Tier-2 penalties. Section 16 (1) of the Act – Licence required to hunt game animals, $500. Section 23 of the Act – Offences relating to contravening conditions of licences, $550 (except as provided in the Tier-2 list below). 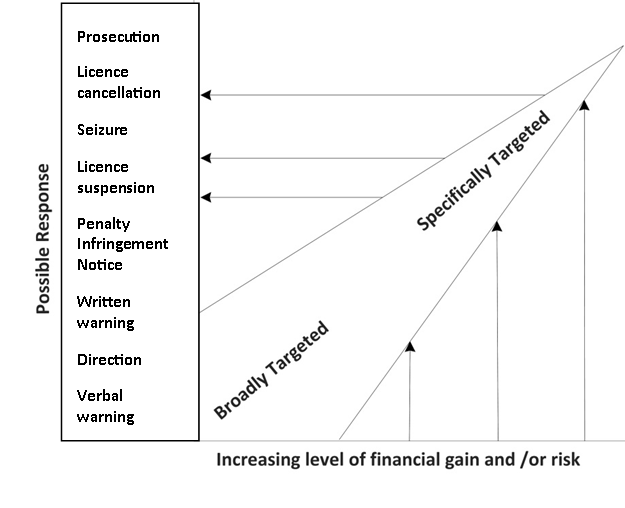 Section 27 of the Act – Offences relating to licences, $500. Section 55 of the Act – Offence of releasing animals for the purpose of hunting, $400. NB. Offences under Section 23 of the Act (except as provided in the Tier-2 list below), are considered serious breaches of the mandatory code of practice and are addressed further in this document. Section 23 of the Act (Schedule 1, clause 2) - Licence to be carried and produced on request, $220. Section 23 of the Act (Schedule 1, clause 8) – Use of baits, lures and decoys for hunting 5 91) game, $220. Section 23 of the Act (Schedule 1, clause 10) – Use of dogs when hunting game birds, $220. Section 23 of the Act (Schedule 1, clause 16) – Return about Hog deer tags to be provided, $220. Section 23 of the Act (Schedule 1, clause 17) – Return of unused Hog deer tags, $220. Section 24 of the Act stipulates the requirement for a code of practice for the holders of game hunting licences. The code is to identify the provisions that must be observed by persons hunting game animals pursuant to a game hunting licence. Schedule 2 of the Regulation provides the Mandatory code of practice. The mandatory provision of the code of practice applies to the holder of a game hunting licence. It is a condition of a game hunting licence to comply with the mandatory code of practice. If the holder of a game licence contravenes any provision of the mandatory code of practice. If the holder is found guilty of an offence in involving cruelty to animals. If the holder is found guilty of an offence of releasing a game animal into the wild for the purpose of hunting it or its descendants. If the holder contravenes a condition of the licence. If the holder is found guilty of an offence involving harm to animals, personal violence, damage to property or unlawful entry into land. In such circumstances as are prescribed by the regulations. NB. In the event of a breach of the mandatory code of practice, the game licence is to be suspended. The period of suspension is to be added to the period of suspension (if applicable) from the Tier-1 and Tier-2 tables. If the person has been found guilty of an offence in the previous 10 years involving cruelty or harm to animals, personal violence, damage to property or unlawful entry to land. If the person is not a fit and proper person. If the person has been found guilty of an offence under section 68 of the Forestry Act 2012 or section 32C (Offences relating to hunting and the use of firearms etc) of the Forestry Act 1916. If the person has been refused a hunting permit under section 32B (Hunting permits) of the Forestry Act 1916 or has had such a permit cancelled. GLU Inspectors are authorised and tasked to investigate allegations of breaches of the Act and the Regulation. Where a prima-facie case is established, an inspector will recommend a penalty to correlate with the offence. This recommendation is to be referred for review to a Senior Compliance Officer or the Compliance Team Leader. Re-sit R-Licence assessment (with Hunter Education Handbook). Re-sit R-Licence assessment (without Hunter Education Handbook). Game licence suspension or cancellation. To assist inspectors to apply proportionate and consistent penalties for offences, the following table has been compiled. NB. This table to be used as a guide. In the event of a breach of the mandatory code of practice, the game licence is to be suspended. The period of suspension is to be added to the period of suspension (if applicable) from the above table. NB. In the event of a breach of the mandatory code of practice, the game licence is to be suspended. The period of suspension is to be added to the period of suspension (if applicable) from the above table. Section 29 of the Act, requires Regulatory Authority to suspend or cancel a game hunting licence if the licence holder is found guilty of an offence involving harm to animals, personal violence, damage to property or unlawful entry into land. From time to time, GLU may become aware of convictions against game licence holders. When considering the suspension or cancellation of a licence, GLU should be guided by the penalty applied in relation to the offence.